Sunday, December 10, 1911: Went to Sunday School this morning. Ruth as usual was on the go again today. She and Rachel had to go off to visit Miss Bryson. Went over to Carrie’s this afternoon. Had to walk through the mud and a sticky kind it proved to be. To do Ruthie’s share of the milking was my fate tonight. You see I must treat her accordingly, as Christmas is approaching. Yuck—it’s not fun having to do a sibling’s share of the milking. Here are the complete names of the friends that the Muffly girls visited: Rachel Oakes, Blanche Bryson, and Carrie Stout. Heat a quart of milk in the double boiler, and when very hot stir in four heaping tablespoons of grated, unsweetened chocolate, moistened with a little cold water; allow it to boil and thicken; have ready nearly a pint of coconut milk into which has been stirred half a cupful of sugar and the whites of two eggs; add this to the chocolate and cook for a few moments but do not allow it to boil. Remove from the fire and serve in cups, adding after it is poured into the cups a tablespoonful of sweetened whipped cream, which has been mixed with a little grated coconut. 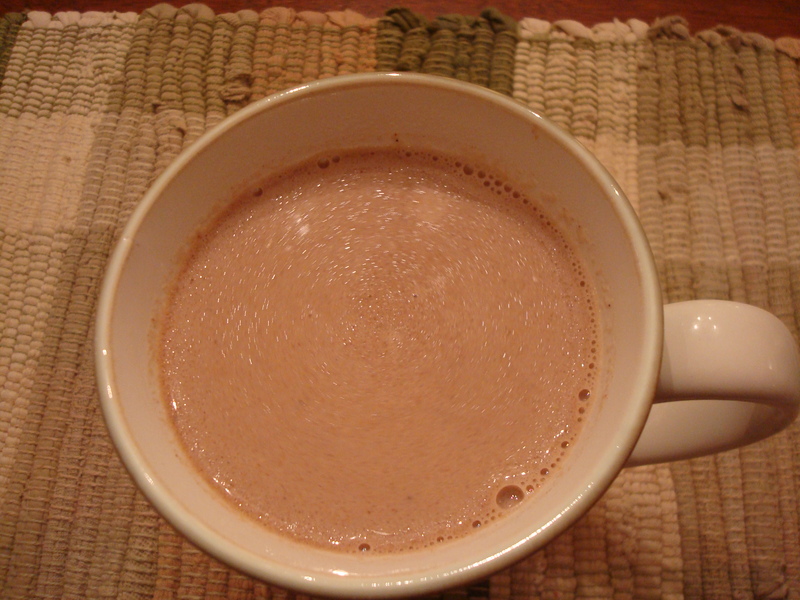 Coconut Hot Chocolate is delicious—though extremely sweet. I didn’t use a double boiler. Instead I used medium heat and stirred the milk constantly. I poured the hot chocolate through a strainer before serving because I had problems with some of the egg white coagulating when I heated it. Maybe I didn’t stir rapidly enough when I added the coconut mixture to the hot milk. If I made the recipe again—I might just skip the egg white. I skipped the whipped cream topping—but it sounds like it would be good. Posted on December 10, 2011 August 30, 2015 by SherylPosted in Food, recipesTagged drinks. This looks amazing! I am so excited to try it!